If you’re interested in transforming every area of your life and are looking for simple ways to become more focused and relaxed in an increasingly stressful world, where the vast majority of individuals are addicted to technology such as their smartphone and social media, it’s well worth reading the Focus Manifesto in order to learn valuable skills and thought patterns which will change your life. What is the Focus Manifesto? 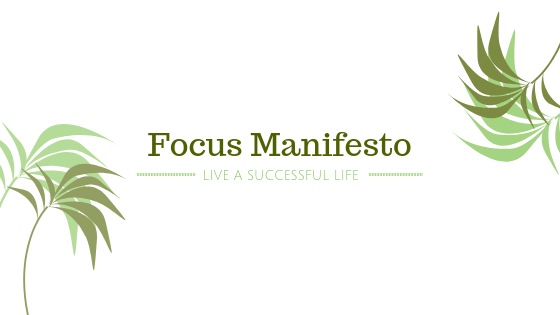 The Focus Manifesto is a successful book which can teach you how to regain your focus and how to concentrate on the areas of your life which need work. Have humans lost the ability to focus in recent years? Simply put yes, as a result of reliance on technology human beings brains are being hardwired to seek instant gratification and instant results and are effectively being retrained to focus on every distraction possible, instead of the important things in life. As an example, most workers aren’t as productive in their jobs as they could be as they are distracted by checking their social media accounts every 5 minutes to see whether their posts have gained new likes. Or you may have noticed that every time you visit a cafe or restaurant, the majority of the patrons have their eyes glued to their phones, instead of talking to their friends and family members and living in the moment. What will the Focus Manifesto teach you? The Focus Manifesto Will teach you how to simplify your life and how to place less importance on things which really don’t matter such as how many comments and likes your selfies get and how to regain the ability to think calmly and rationally and to prioritize tasks which will help you get further in life. What areas of your life will you be able to transform by reading the Focus Manifesto? Utilizing the proven techniques which are taught in the Focus Manifesto you’ll be able to climb up your chosen career ladder, start your own business, increase your health and fitness and develop stronger and healthier relationships with your loved ones. So no matter what long-term goals you’ve set for yourself, you should be able to make lasting, noticeable changes to your life by rewiring your brain to focus and concentrate on the things in life which really matter again. Does the Focus Manifesto offer any other useful benefits? Yes, after reading the Focus Manifesto you should find that you’re calmer and less stressed on a day to day basis. As once you stop concentrating on things in your life which don’t matter and which cause you to stress, you’ll be free to enjoy your life to the fullest. So if you regularly feel stressed, tired and burnt out it’s well worth seeing what the Focus Manifesto can teach you. So if you’re honest with yourself and don’t think that you’re currently living up to your full potential and are interested in transforming your life and becoming a happier, less stressed version of yourself it’s definitely well worth reading the Focus Manifesto!